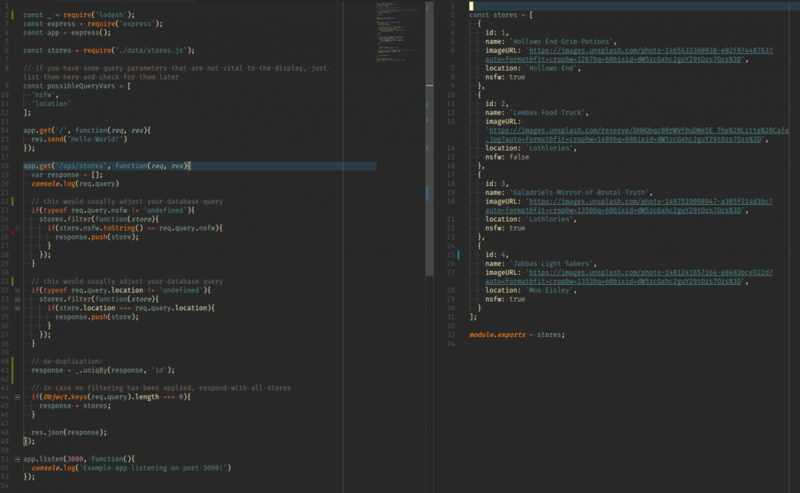 First we’ll write the backend server, the frontend will follow in the next post. This post doesn’t assume much knowledge of anything really and is aimed at beginners with the slightest of command line skills. The full code will be provided at the bottom of the post. Alright, we got the basics working, but the hello world text will not get our startup far. You need to actually provide valuable content to your users if you want to become the next yellow pages or facebook or store locator for supernatural goods! Now these are a bunch of imaginary shops, but how do we actually get them out to our users? Hint: Yes, the new Firefox does pretty JSON by default. Now we can provide all of our example data to our users, but how can we enable them to filter it? That’s great, but maybe we also want a drop-down for the location, so if we would implement it just like the other if conditional we would not be able to filter for both, because we overwrite the array response. We’ll need to implement it a bit differently and also take care of de-duplication. Note that usually your database server would take care of that and we have to write extra lines because we’re using a simple array. Note that we’re not taking care of responding with the full list of stores in the bottom if no keys are set on the req.query object. 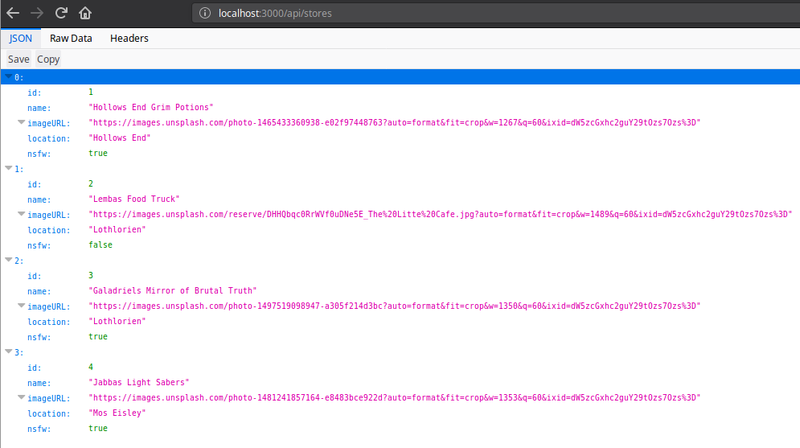 Now we can also mix the search or filter by adding multiple query parameters, try accessing http://localhost:3000/api/stores?nsfw=true&location=Lothlorien, which will include all results that either are nsfw or at the location Lothlorien. I know it’s actually Lothlórien btw, but that’s beyond the point of this post. Now you’ve created a basic API that accepts query parameters to filter items by query parameters with express.js. In the next post we’re going to have a look at how to build a frontend to actually display the stores from different fantasy universes properly. If you’re looking for a good place to host your backend, check out: Best Cheap VPS Hosting Comparison. If you have any questions or additions, please throw me a tweet or leave a comment below! Hi, This is a great tutorial, however when I try to use 2 query strings I get unexpected results. Please see this stack overflow question. I’m not sure if others are experiencing the same. Hey it’s great to learn a bit about these things. I never made an api before and maybe it’s because of this but don’t get the same results as you. I just tested this and it works on my end, with “true” it shows 4 records, otherwise only 3.